“Hey everyone who’s running for Land Commissioner, if I give you tons of money will you step out of the race,” declared Dewhurst. “Sounds great, money will always take precedence over morals, after all I’m a politician,” replied everyone running (Except Jerry Patterson). “Forget that, I’m in this to represent my state,” said Patterson. “Well, you’re gonna pay for that. 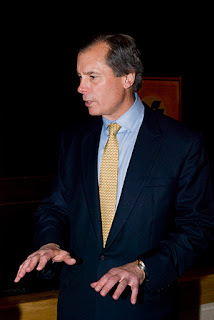 I’m gonna run a nasty campaign against you now,” Dewhurst responded. “Fine, but I have morals and even if I lose at least I know I’m not a sell out,” said Patterson. After a nasty campaign and many republican’s having to cross lines they never wanted to, Dewhurst got his way and became the Texas Land Commissioner in 1999. So that’s pretty much how I’ve viewed him ever since. Until this past Tuesday. Of course, any politician is going to preach to their audience and not rock the boat, so I’ve kept that in mind. But with all that said, I’m very impressed with him. I agree that we need to do away with standardized testing and start implementing end-of-course exams. Imagine teachers being able to teach their curriculum!!! And I agree, we do need to do something about the boarders. I don’t think a wall is the answer because just like Dewhurst said, “If they want to come over, a wall is not going to stop them.” And concerning the boarders, it’s not a hateful act against Mexico, it’s an attempt to hinder everything coming into this country illegally from drugs to people. And like Dewhurst, I’m fine with people being here that are undocumented, but just get a Visa and pay taxes. And if you want to become a citizen, then get in line like everyone else and do it the right way. Of course there were other issues discussed but the main thing that really stood out to me was that he was for education (of course he was at a college so who knows if it’s 100% accurate). But he was part of the process for the “B” On Time Loan, he was part of the process of getting our health benefits reinstated after Gov. Perry recklessly vetoed them all to smithereens, he’s working towards end-of-course exams as opposed to TAAS or TAKS, and last but not least, he has a concealed hand gun license (haha, that’s really not a selling point but I just thought I’d throw that in there).